Pro-life groups in Indiana are fighting for free speech. Watch the video below to learn more. This September pro-life Arkansans will gather for peaceful prayer outside abortion facilities. The prayer vigils are part of the 40 Days for Life campaign. All across the country, Americans will join together praying that abortion will end. 40 Days for Life will begin in less than two months on September 26, and it will last until November 4. 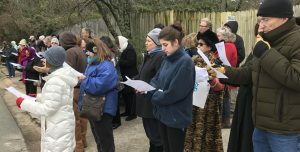 Volunteers will take turns praying outside abortion facilities from 7:00 AM – 7:00 PM throughout the day. Leaders are looking for churches who will each recruit enough volunteers to cover one or more days during the 40 days. Typically, a volunteer will pray for only one hour outside the abortion facility, so it takes at least 12 volunteers to cover an entire day. These gatherings are not rallies or protests. They are peaceful assemblies for prayer and reflection — and they work. Every year we hear stories from other states of abortion clinics shut down and abortion workers coming to Christ in the wake of a 40 Days for Life prayer campaign. We want Arkansas to be next. This is your opportunity to help us end abortion, and all you have to do is pray. People in central Arkansas can learn more about 40 Days for Life by contacting Toni Blackwell at 501-650-2993 or 40DaysForLifeLittleRock@gmail.com. In Northwest Arkansas, you can learn more about 40 Days for Life by contacting Sheila Pursell at 469-231-1959 or 40DaysNWA@gmail.com. American Family Association is encouraging families to avoid Target stores during the back-to-school shopping season. Sign the pledge to boycott Target here.